The book THE DEATH OF DEATH IN THE DEATH OF CHRIST, here presented in an easy-to-read version, was published by Owen in 1647. It is suggested that no-one has ever succeeded in refuting the thesis that Owen here so fully expounds and defends from the scriptures. Includes a forward by J I Packer. 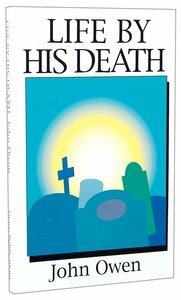 About "Life By His Death (Great Christian Classics Series)"
Owen is one of the most prominent theologians England has ever had. Owens first book was published in 1642, and his last was passing through the press at the time of his death, in 1683. His published works include a total of twenty-four volumes. Oliver Cromwell used John Owen as his personal chaplain for some years, and had him preach to Parliament a number of times, from 1646 on. He pastored three churches during his lifetime. Owen married twice; his first wife died in 1676. He had eleven children, none of whom survived him. His grave is still preserved in the Bunhill fields burial ground, city Road, London. The book The Death of Death in the Death of Christ, here presented in an easy-to-read version, was published by Owen in 1647. It is suggested that no-one has ever succeeded in refuting the thesis that Owen here so fully expounds and defends from the Scriptures. This is an easier-to-read and abridged version of Owen's classic The Doctrine of the Saints Perseverance Explained and Confirmed, written in 1654. Here, Owen puts forward his argument that true believers, born again of the Holy Spirit will always be protected against falling away from God. A compelling contribution to the understanding of this important issue. This collection makes the timeless wisdom of generations of Christian thinkers available to a today's readers. Abridged and presented in easy-to-read modern English, these economically priced Christian classics are published by Grace Publications, an imprint of Evangelical Press. It must surely be a sad thing that there is so much disagreement among Christian believers about the nature and work of the Holy Spirit. Part one of this book presents the Bible teaching concerning the Holy Spirit. Part two deals with the relationship between the believer and the Spirit in daily experience. The book is therefore both doctrinal and practical in its purpose, presenting material from Smeaton and Owen in an easy-to-read style.